“Yes, it’s Superman, strange visitor from another planet, who came to Earth with powers and abilities far beyond those of mortal men. Superman, who can change the course of mighty rivers, bend steel in his bare hands, and who, disguised as Clark Kent, mild-mannered reporter for a great metropolitan newspaper, fights a never-ending battle for truth, justice and the American way…” But what lead to all of this? That’s the question director, Zack Snyder attempts to answer in the latest treatment of “the last son of Krypton,” Man of Steel. It has been 75 years since Superman first appeared in 1938’s Action Comics’ premier issue. Since then, the character has starred in countless comics, TV shows, and movies. Yet, with Man of Steel, Superman’s sixth cinematic appearance, most of the buzz revolved around Christopher Nolan’s involvement with the project. 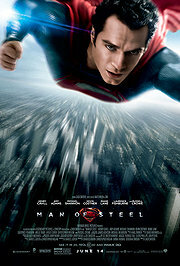 Nolan, most known as the director of the remarkable Dark Knight trilogy, teamed up with his Dark Knight series co-writer, David S. Goyer to write the screenplay for Man of Steel. Nolan and Goyer successfully revitalized the Batman franchise by making it edgy, making it smart, and taking a fresh take on a familiar story. Thus, the hopes are that they were able to do the same to DC Comic’s most popular hero, Superman. Man of Steel, unfortunately, does not quite deliver the goods. The film opens on Krypton as the doomed planet is self-destructing after its inhabitants have mined the nutrients of its core, causing a full on apocalypse. Jor-El (Russell Crowe) and his wife Laura decide to place their newborn son, Kal-El in a capsule headed for Earth in the hopes that he will know a better life and continue a form of the Kryptonian line of people. Kal-El is, of course discovered and raised by Kansas farmers, The Kents where he is famously renamed “Clark.” Conflict arrives when Kryptonian General Zod (Michael Shannon) arrives on Earth searching for Kal-El as part of his mission to obliterate man-kind in a genocidal plot to repopulate Earth with pure Kryptonians. Man of Steel sets out to offer a different tone than is usually found in a Superman film. Henry Cavill’s performance as the title character is far more serious, insightful, and raw than any previous Superman. Additionally, this is the most violent Superman film to date, proliferated with tragedy and destruction. Director, Snyder does offer a fresh take on the well-known origin story with a non-linear timeline that bounces back and forth through Superman’s first 33 years on Earth. He also, gives audiences a lengthier glimpse at Krypton than found in previous films. The non-traditional timeline works very well, preventing the film from hitting snags as the character grows. Instead, audiences are able to see Superman earlier with a peppering of flashbacks to add context to his story. With all of this being said, the film lacks the edge and intelligence necessary to allow it to, well, soar. The opening sequence on Krypton is a welcomed change, but the planet is already experiencing so much unrest that it is hard to believe these alien people are anything but flawed and miserable. In fact, this scene introduces a sort of Brave New World motif where choice has been bred out of Krypton, and society chooses the fate of all inhabitants. The screenplay opts for simplicity over complexity, which forces the film into a brainless extended action scene for the final hour; a scene that puts the “never-ending” in the “never-ending battle for truth, justice, and the American way.” Coupled with these extended action scenes is Snyder’s shooting technique. He uses a lot of shaky, hand-held camera shots, which do become strenuous at times. Perhaps the most major missed opportunity is the weak exploration of young Kal-El’s/Clark Kent’s struggles as an alien in a strange world. While Snyder does explore this, he does so in a fashion that merely glosses over the surface. Scene’s involving Superman’s youth are far too underdeveloped and border on stereotypical. Furthermore, the fun and the romance that are expected from a Superman story are in short supply in Man of Steel. Instead, this reboot attempts to ground a movie about alien superpeople living and battling on Earth in some sort of reality, which is a bit preposterous. The casting is certainly the film’s major strength. Cavill is, of course, an excellent choice for Superman. He looks the part and has great presence on the screen. Amy Adams gives a performance as Lois Lane that veers far from her just being a silly girl getting into trouble all of the time, and Michael Shannon gives another full-tilt-crazy performance as Zod. Other familiar minor characters are also well cast including Laurance Fishburne as Perry White and Kevin Costner and Diane Lane as Ma and Pa Kent. Man of Steel is rated PG-13 and has a running time of 2 hours and 28 minutes. The film was post-converted to 3-D, however there are some exciting sequences that are enhanced by the conversion. Nonetheless, 2-D is recommended and there is no stinger after the credits, so feel free to go home if you’re not interested in who the 2nd assistant sound editor was.